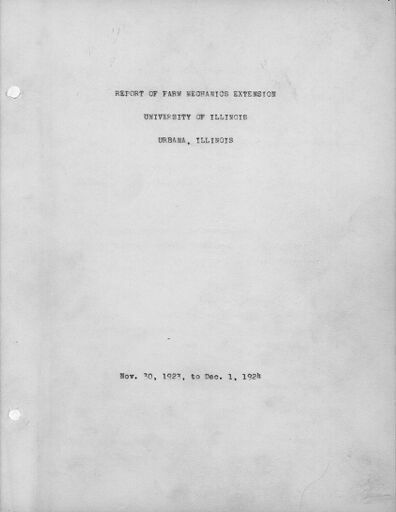 Digital Surrogate from the Report of Farm Mechanics Extension Records,contain a digitized report including survey data, circulars, and photographs concerning research and the introduction of new technologies and equipment to agricultural communities in Illinois through exhibits and subprojects on preventing soil erosion through the use of mangum terraces; promoting the use of horses, tractors, and gas engines; storing and growing corn; and implementing equipment to facilitate new ways of using rooms in houses as work spaces. The Report of Farm Mechanics Extension Records (Digital Surrogate), 1923-1924 are managed by the University of Illinois Archives and do not feature precise descriptive information for each item. Discover their contents by browsing the folders and files. For more information, contact an archivist at illiarch@illinois.edu.